In the spirit of the day, we present a French wallcovering that’s good enough to eat. A plump rooster stands atop a loaf of bread observing a jug of wine, a jar of cheese, a salt cellar and a bunch of turnip-looking root vegetables. The loaf of bread is stuck with a knife – perhaps an allusion to the fowl’s nearing fate. Off to the side a blue, neoclassical urn with gold trim holds a bouquet of pink roses, and a lilac branch rests directly on the blue marble countertop. The paper’s blue background, now crackled with age, has come to resemble the marbled surface of the counter. The size and shape of this paper, printed c. 1825, designate it as either an over-door panel or a fire screen which would cover the hearth when it was not in use. Because of the subject matter, I like to imagine that this was used in a dining room. Today a rooster might seem an odd choice for a meal, but back when this paper was printed, capons, a.k.a. roosters that have been castrated and fattened in order to become more delicious, made regular appearances on French dinner menus. In the 1820s Louis Eustache Ude published The French Cook in Philadelphia. Ude was a former chef to Louis XVI, and had escaped his employer’s fate by fleeing to England, where his book was originally published in 1813. The French Cook is the earliest known book of recipes from France to be printed in the United States, and it became quite influential. Among other unfamiliar meats of yesteryear, Ude recommends “A capon, garnished with cresses” as the second course in an elegant dinner for sixteen to twenty persons. 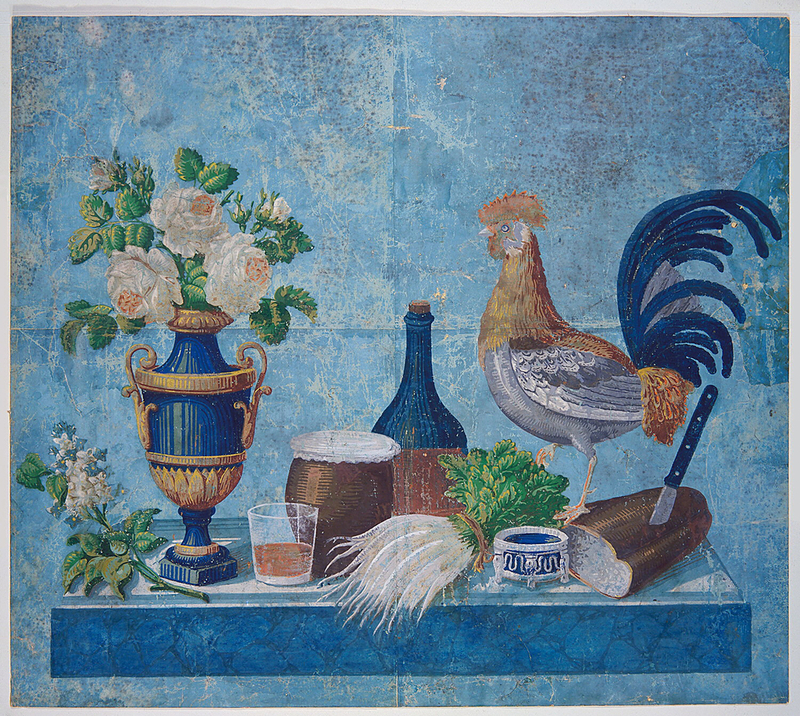 Since the turkey-centric Thanksgiving holiday we know today was not established at this early date, it’s quite possible that a capon, like the one depicted on this wallcovering, could have been served up for family and friends with turnips, a loaf of bread and a big jug of wine.